The Star Trek franchise always had a bumpy ride when it came to the film industry, with its very first motion picture receiving a critical mauling and lackluster box office returns. While The Wrath of Kahn remains a successful and equally loved sci-fi hit, it wasn't until J.J Abrams' 2009 Star Trek that the series broadened its appeal beyond the Trekkie fanbase and reignited interest within modern audiences. Fours year on, the next stage of the planned trilogy has arrived. And believe me, it's nothing like you'd expect. 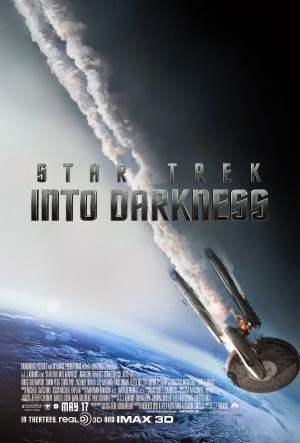 The reckless behaviour of Captain James T. Kirk (Chris Pine) leads to his demotion from captain of the USS Enterprise; a rank he is soon forced back into when Starfleet is attacked by one of their own operatives, John Harrison (Bennedict Cumberbatch), who for years has been wanting to settle a personal score with his commanders. With the help of Commander Spock (Zachary Quinto), Leonard McCoy (Karl Urban) and the rest of his crew, Kirk must now journey into the depths of space and seek out this deadly new foe; but he finds out there is much more to these events than he initially expected. Ignoring the excellent performances and thrilling set pieces, what made Star Trek such a fantastic reboot was the quality writing which developed likeable characters and exploited clever dialogue and plot advancement. All this returns in Into Darkness, with the main actors reprising their roles beautifully and the dialogue better than ever. The humour is timed to perfection with an excellent wit, and you'll never cringe at any of the lines. Cumberbatch truly shines throughout the cast, delivering an intimidating and monstrous performance as the villain but thankfully never resorting to philosophical and melodramatic statements every time he speaks - something I feared would happen. Also, dat voice. The narrative is very faithful to the title, delving into darker themes and content that the first Star Trek merely touched upon. The relationship between Kirk and Spock is developed beautifully, really becoming one of the most important elements of the film that's complimented by stellar performances. The plot twists dramatically shift the focus; the film was not what I expected from the trailers, but this is a very good thing, delivering a deeper focus on character and surprises with perfect pacing. Into Darkness thankfully never gets too complex with its narrative structure - and what's better is how the alternative timeline explored in its predecessor is thankfully still acknowledged, forming it into a constant aspect of the plot instead of an abandoned one. The special effects impress throughout and it's all made even better in gorgeous IMAX 3D. Whether we're talking about the makeup, CGI or excellently crafted sets, Into Darkness never disappoints visually and provides an incredibly rich aesthetic experience. Set pieces are shot well and consistently thrill, even if they can be a bit too noisy. The final battle ends on a somewhat anti-climactic note, but otherwise the film flawlessly threads together a gripping story with creative action sequences. Fans of the franchise will love the nods and subtle references, and Into Darkness is an essential watch for anyone remotely interested - which should be everyone.